I miss waking with the daylight and I resent the early darkness in the evening, depriving me of the opportunity to visit the allotment garden after the working day. It’s the time of the year when, for many of us, gardening has become a privileged experience. I spend much of the week watching the weather forecast, keeping my fingers firmly crossed for fine weather each weekend. I try not to allow the lack of gardening time to drive me completely to despair. In between the dark mornings and the early dusk, November is still a month of incredible beauty. Guy Fawkes Night might have passed, but nature still offers its own display of fireworks. The trees hold onto their final sparks of leaves and the hedgerows provide their own pinpoints of colour in their berries. For that I am grateful. If you haven’t planned ahead, then there will be little growing on the plot over the dark, winter months (Big failure on my behalf this year) and little to plant or sow too. Garlic can still be planted out and I am rather proud of the parsnips. I’ve harvested a few so far and a feel stupidly ashamed how easy these were to grow. Katie over on Lavender and Leeks also reminds us that there still time to plant some bulbs for a much-needed boost of colour in the New Year. The allotment garden never sleeps – not really. It’s a great time to carry out other important tasks like build and create structures on the plot including raised beds or a shed. If you dig, then this is prime time for doing that and if you don’t, then spread the organic matter over the beds now. Doing these activities on a crisp, winter day is still an experience I relish. Even when the darkness takes its early hold, there is still some gardening activities to enjoy and benefit from. Armchair gardening is the perfect opportunity to pour yourself a cup of tea and sit comfortably in your favourite seat (Mine’s a burnt orange wing back, by the way) and think about the wonderful crops and flowers to enjoy in 2018. A few months ago, I was thrilled when the lovely people at Dobies contacted me and asked if I’d like to work with them next year. 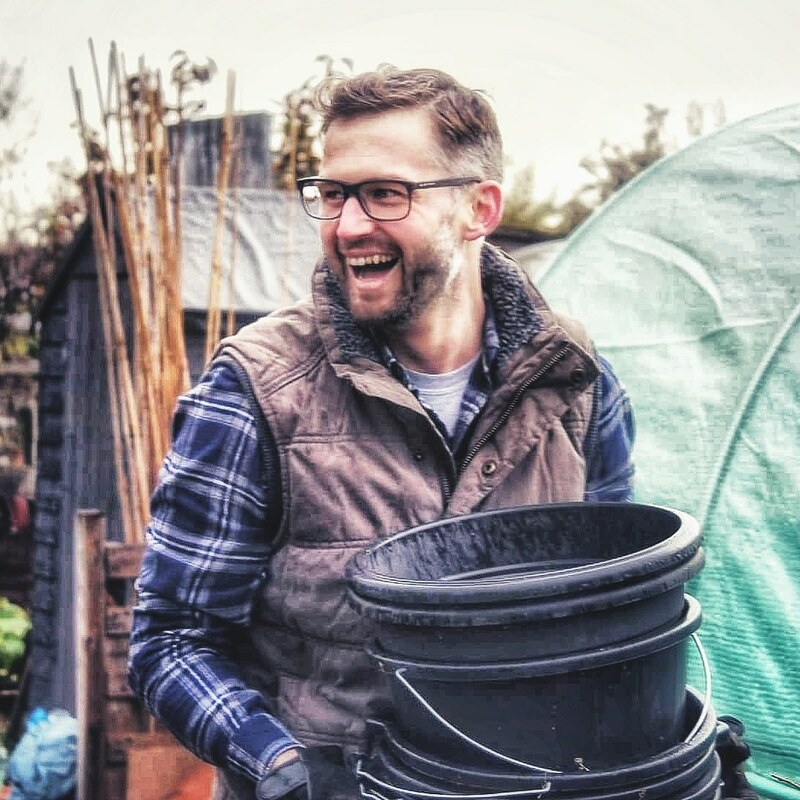 My ambition with the allotment and with this blog is to engage others, especially working families to join in and grow their own fruit and vegetables. If not on an allotment, then in their garden or even a few pots. It’s also about supporting Ava to develop a relationship with food, to know where her veg comes from and to really enjoy eating it. It’s a golden thread that links these two things together. To meet both these aims, I’m looking to make growing your own as easy and as manageable as possible and exciting by picking varieties of veg that offer interest, colour and of course really great taste. I’ve used Dobies to supply me with seeds a lot over the 10 years I’ve been allotment gardening and I’m a big fan of the fruit and vegetables Rob Smith has put together for his own heritage range. In 2018, I’m growing 20 varieties of veg and flowers from Dobies new range. I was spoilt for choice when they asked me to select 20 varieties from the stock, but I’ve kept in mind my personal objectives for kitchen gardening. A large, mild flavoured Italian variety dating back to 1981. Prolific producer of sweet tasting peas. This variety grows tall which means more crop in the same space. This mini variety looks so great, I couldn’t resist. It has a sweet taste and grows as a semi-bush producing 5 or 6 fruits per plant. I took one look at this and had to pick this one to try. Incredible, two-tone pink and purple coloured snap pea. A yellow curd and a name of Cheddar. How could I resist a cauliflower-cheese to grow next year? An early variety and the sun encourages those curds to become an even brighter colour. I haven’t grown enough cabbages on the allotment so I’m gonna change that in 2018. Sunta is an attractive summer cabbage and one of the earliest to mature. A reliable, heritage variety which produces firm, flavourful hearts for a spring harvest. Modern, easy to grow variety of a traditional allotment favourite. I’m a huge fan of beetroot and so had no problem choosing a new one to try. This is a round, very dark variety. A love the colour of these leaves. This is a quick and easy to grow variety with a taste described as between mustard and brassica with a hint of spinach. A slow to bolt lettuce with some dark purple colouring. I’ve not grown Chinese Cabbage before but I’m excited to try this one out. It’s red but holds no bitter taste. The colour on this beefsteak variety grabbed me. The fruit also contains few seeds too. I’m not sure if I have a bit of an orange thing going on, but here’s another crop of that colour. A dwarf, productive variety with tasty fruit. These will work in containers on a patio and even a balcony. Baby pink and white flowers and loved by butterflies too. One for cuttings too. A dwarf variety with red, pink, blue and yellow flower spikes. Mahogany and gold flowers. A compact and vigorous variety which is perfect on the veg patch. These look fantastic. A bush variety with flowers on multiple stems. One for the vase too. 19. Crepis rubra – Hawk’s Beard. Pink dandelions? Well, these look exactly like that. Incredible colour but not invasive. Medium height producing white flowers with a flush of pink. I think Ava will love these. The flowers have a silvery sheen and last the entire summer. I’m so excited about growing these crops next year and I’ll be writing all about the experience here on the blog. I’ll also be writing a monthly blog for Dobies over on their website too. What about you? Are you picking out the crops you want to grow next year? If you are planning on growing any of these from the Dobies range, I’d love to know. It will be fantastic to hear about your experiences during 2018. Drop me a comment below. Dobies have provided me with 20 crops from their 2018 range. All views and opinions are my own. Hi Karen. Thanks for dropping by. Well, I’m not sure I’m organised at the moment, but having all these exciting crops to grow next year, I bet to get myself so! That sounds exciting. It’s not something I’ve considered so far so I look forward to hearing how you get on. That’s exciting news, Richard! I look forward to reading more. Hi Judy. Thanks and yes, I’m really excited to grow these crops next year. Love that you included flowers in this list! Thanks for sharing. Thank you! Yes, it’s taken me a while but flowers are very much an important factor for me now. I’ve grown to have a real appreciation for them since being on the allotment and definitely with the community online. Very excited. I also spent last week hoping for a fine weekend so I could get on the plot. Cold but lovely sunshine so made a start on the raised beds. I love those days. I find I can be so productive. When the busyness of the main growing period has receded, the weeds are not jumping up through the soil at a constant pace, it’s wonderful to have cold, dry days to get some prep work done.